Dhanu Rashi is an adventurer and independent spirit who cherishes freedom above all else. 2016 is very calm and somewhat devoid of adventure at least until the end of the year. So the Sagittarius zodiac may get very bored! There is great news for the Dhanus Rasi however. The 2016 Bhavishya Rasi forecasts that this year brings you good fortune and luck like you have rarely seen before. You will be able to put more into action than before but you need to prioritize. The past few years have been exciting but they have also been hard work. So if you can take a break and go on a vacation, relax and enjoy the calm, this will be a great year for you! Here are a few tips to get over a jet lag. The 2016 Dhanu Rashifal predicts that those in the creative or artistic areas should show their work this year, as it will be well received. If you are a teacher you will receive respect and admiration this year. Everyone will want to learn from you and be around you this year. Good things will happen for you in the workplace this year. You might get a job you have always wanted or start a new business. If you don’t have a job, now is the time to hand out more resumes and schedule more interviews. It is also a good time for the Dhanus Rasi people to start training or take new courses to excel in these jobs. The Bhavishya Rashi 2016 Jyotish predictions forecast that your money will be at a new high thanks to the work you have done in previous years. Your finances will look good for this year thanks to the new opportunities from your career. Those who are self-employed and in business, will get more clients and customers. Others will get promotions and bonuses. This is a good year to take risks but don’t take big risks with others’ money. Opportunities are happening for the Archer in 2016. The varshik Dhanus Rasifal 2016 predicts that this year starts out well for you with new friends that could turn into love. You will be excited and you will venture to new places and meet more people. Those who are already in a relationship will make friends too but their relationships will also move forward. Maybe they will set the date for their wedding or move in together. Your family will need your increased attention as well. This can be a bit frustrating for you as you crave adventure. But some of your relationships have been tested the last couple of years. So if they have made it through then they are true. You will be stronger and wiser for it. You will feel more connected to these people than ever before. Those who are single could find love. Here are tips to finding the right dating site online. You may be looking at getting a new home or renovating your home in 2016. This may seem scary at first but in the end it will be worth it. 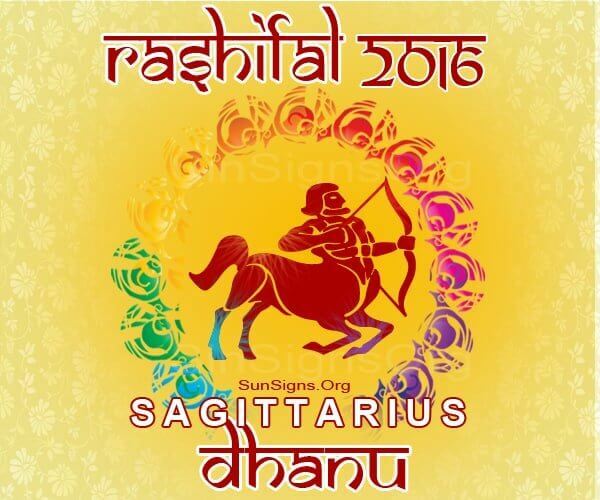 The Dhanu Rasi 2016 horoscope foretells that this is a good year for your health, Sagittarius. You might have some minor issues; mostly stress related but otherwise you are in good health. Take care of yourself, eat right and watch your weight. You can keep these health issues to a minimum. Lemon and walnuts can help in your weight loss program. In conclusion, the 2016 Dhanu Rasiphal foretells that this year will provide you with good fortune and opportunities. You also have the chance to relax and rest on your laurels. Try not to create more drama for yourself then there needs to be. Take this time to improve and work on yourself and your dreams. Nurture yourself and your relationships. You will find that 2016 will be a great year. Keep a look out for the 2017 Dhanu Rashifal.